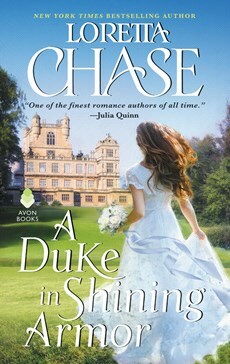 Duke in Shining Armor is a Regency romance - one I thoroughly enjoyed. I loved Lord of Scoundrels when I read it by the same author, and this one pretty much matches it. While Ashmont the almost Groom was a little bit of a hopeless case I can see that he will have his day of redemption now that he has been challenged with Olympia, and as well the third Dis Grace, married to Ripley's sister, seems to be having some kind of mystery marital difficulty. So there are two good setups for two more books, and quite frankly I am absolutely looking forward to them. I like snappy dialogue! I entered a giveaway on GR for this book. Oh this sounds fab thanks Kathryn!!! I like the Regency Romances. Just what is needed when I am stressed out! I have Lord of Scoundrels on one of my shelves waiting for me and I've heard fantastic things about Chase. Sounds like I need the whole Dis Graces series!